Which of the following hardware devices is called a graphic adapter that processes the graphic output from the motherboard and transmits it to the display unit? Answer:B A video card is also called a display card, graphics card, display adapter or graphics adapter. Function of modem is to _________. There was a mistake in the answer. It has been corrected now. Answer : C (Both a and b) A modem turns signals from digital to analog before transmitting those signals over communication lines such as telephone lines that carry only analog signals. The signals are turned back into digital form (demodulated) at the receiving end so that the computer can process the data in its digital format. You are Right, It is C.
Which of the following key combinations helps you to open Font dialog box in MS-Word 2010? This is wrong. Ctrl V is paste. Correct answer is CTRL+ D We will correct the question shortly. Thanks for reporting. I took two steps towards east, three steps towards north and reached point R. Where did I start from if I am at R now? Find the figure which is different from others. 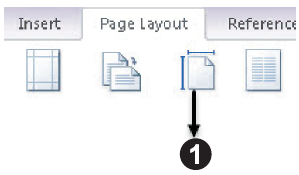 What is the function of the icon marked as in the given snapshot of MS-Word 2010? Which of the following keys when pressed once, capitalizes each letter typed?